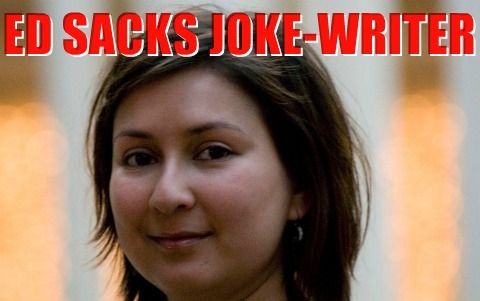 Ayesha Hazarika – a former stand-up comedienne – who previously crafted one-liners for PMQs has been sacked by Ed Miliband as his spokesperson. Labour sources say that the Political Adviser (PAd) wasn’t sacked over yesterday’s dismal performance in particular. The decision was made some weeks ago, in part because Ed Miliband felt she wasn’t performing well in the role of presenting him to the media and he was also increasingly uncomfortable over her close relationship with Tom Watson. Ayesha has been consoling Tom during his marriage break-up. On hearing that her former SpAd was to be sacked by Ed Miliband, Harriet Harman offered Ayesha her old job back working for her. This didn’t go down well with Ed Miliband who took Ayesha’s re-appointment by his deputy-leader as something of an affront to his authority. Such is the weakness of his leadership that Harriet Harman ignored Ed’s protests. UPDATE: Ed’s people now spinning Ayesha wasn’t sacked, she was “made redundant”, that must be because Ed Miliband doesn’t need a media spokesperson and Harriet needs another? Paul Waugh was told this morning that she left by “mutual consent”. Hopefully they will get their line straight by lunchtime.